Ingredients for this recipe will yield more than you need to prepare it, so you can use leftovers for extra meal or bento ingredient. Using the egg pasta recipe, prepare 6 sheets of lasagna sheets on level 7 or 8, making sure they are at least 2 inch longer than the ravioli tablet, and set aside. Make sure to add at least 2 inches to the length of the ravioli tablet, because when you press it to make little indents for filling, the actual length will shorten. Heat up 2 spoons of oil on a medium-high heat and start frying the ground meat, splitting it into small chunks. When the meat is slightly browned, add shallots, honey, herbs, salt, and pepper, and stir-fry for few minutes to mix everything up. Take off heat, add chopped green part of the scallion and mix everything up. Make sure that your filling is completely cooled down before you attempt making ravioli, otherwise the dough will get sticky and break. 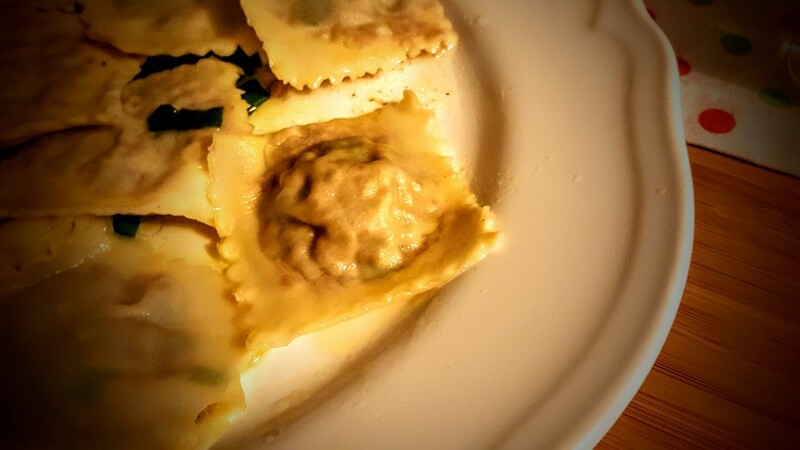 This is the funnies part of the cooking: sprinkle the ravioli tablet generously with flour, then place one sheet of pasta, and using your thumb make small indents for the filling. 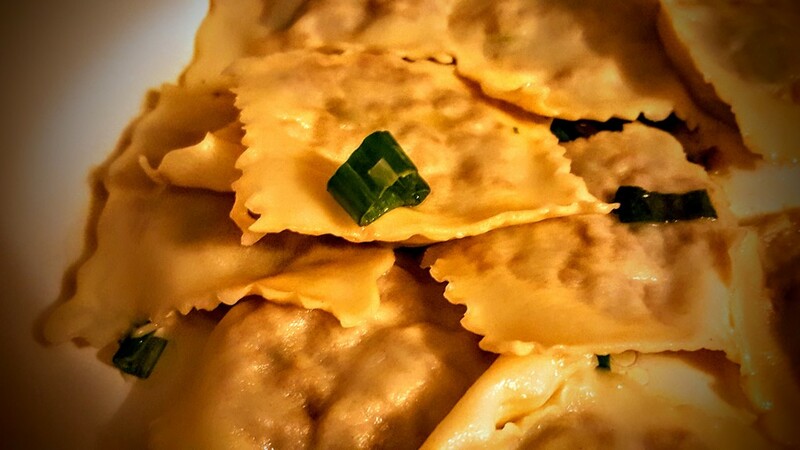 Fill each indent with filling, press gently, then cover everything with another sheet of pasta and using a rolling pin, cut out your ravioli, and set them onto a piece of parchment paper, making 36 ravioli. 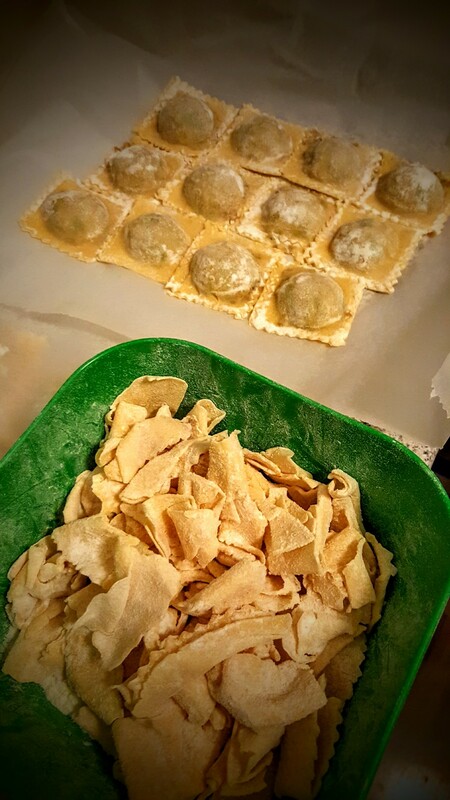 Use sheets of parchment paper folded in two as temporary "pockets" to store your ravioli. Heat up at least 3 litres of salty water (1-2 teaspoons of salt), and dump ravioli in batches (12 per batch), and using a strainer spoon, remove after 4-5 minutes when they float on the surface and serve immediately with some olive oil and chopped greens. Perfectly delicious!